Manchester city is part of a large metropolitan county called Greater Manchester. 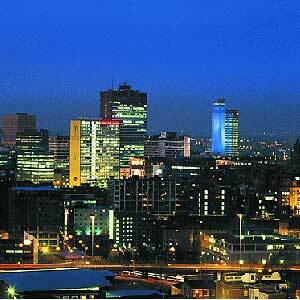 Located west of the Pennine Hills, Manchester in England is the industrial hub of the country. The city of Manchester has been home to a powerful industrial spirit and culture aided by favorable natural resources, climate and geographical location. It is little wonder that the Manchester area of England continues to provide more than half of Britain?s manufactured goods and consumable articles. Manchester city provides work opportunities to millions of people living in the radius of the city and is also a tourist attraction in its own right. Manchester in UK has the distinction of being connected by the most extensive motorway network in the country. On account of its central location within the UK, Manchester is a tourist base for those seeking to take in the English countryside. The seaside towns of Blackpool, Lytham St Annes, Southport and Fleetwood are just an hour?s drive from the city of Manchester. You can visit a few of the National Parks situated in the vicinity. Manchester city is synonymous with football ? Manchester United FC and Manchester City being the major football clubs. Football and other sports are intrinsic to the culture of Manchester UK. Manchester can boast of the highest concentration of football clubs per capita as compared to anywhere in the world. Our Manchester online portal will take you through Manchester city ? its history and origin. For those who wish to travel to this rich industrial city, we provide information on travel and transportation to Manchester. Today Manchester UK is an ethnic mix, with Asian markets and it?s own Chinatown. Home to family-run breweries, Manchester boasts of pubs where you can enjoy the local brew. You can sample various culinary delights. Who can talk about Manchester and not talk of the football clubs? We bring you the latest information on Manchester United football club. Read up our informative articles on places of tourist attraction in Manchester UK.